At the end of last week’s blog post, I said, “Two down, thirty-eight to go.” It sounded impossible when I said it, but I was still determined to meet my blog goal of creating fifty plein air paintings before my third blogiversary, which is also my sixty-second birthday. That’s February eighth. Once I did the math, I knew I needed two paintings per day, plus an extra two somewhere along the line, to meet my goal. Today, that goal feels slightly less impossible. 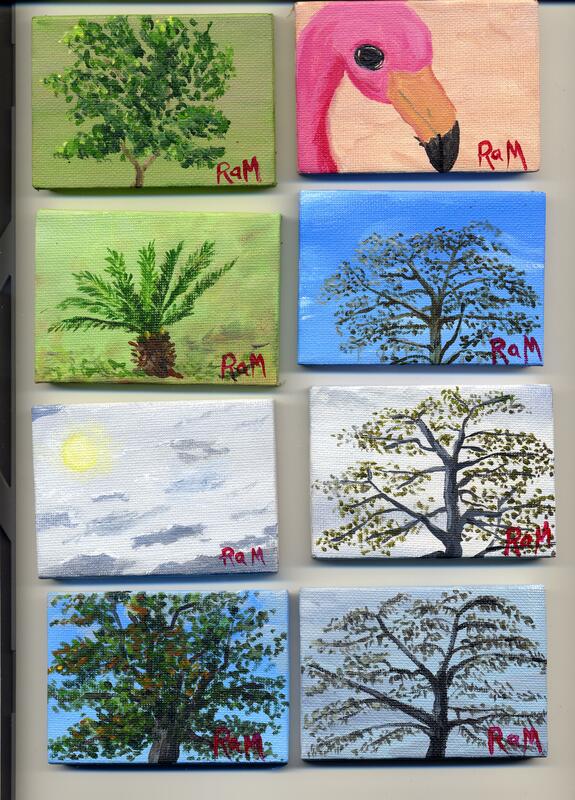 These may be tiny, but there are fourteen of them, and I painted them since my last blog post. I know I can do three in one day because I had to do it a couple of days this week to make up for the fact that I did not paint on Saturday. That was the day we had snow flurries. I’m sure there are intrepid painters in places other than Florida who would think nothing of painting in such weather, but I stayed inside that day, covered in fleece blankets and drinking hot beverages. I have no regrets. 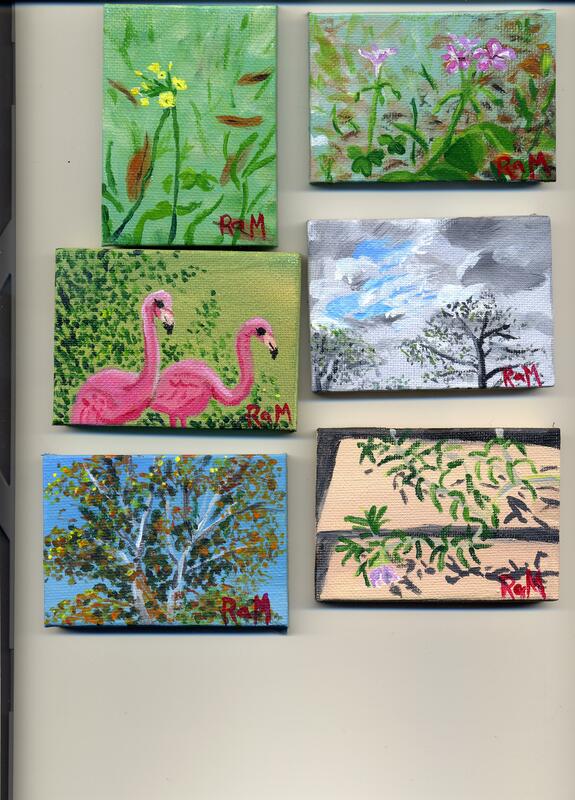 I hope to move further afield eventually, but all of these itty bitty paintings were done from my back yard or front yard. I wanted to paint and I wanted to make it as easy as possible, so I would enjoy it and keep doing it. I didn’t pressure myself with expectations about quality; I just painted. I told myself that nothing mattered except the process. I’m learning from my mistakes, so I might as well make a lot of them. I like these little paintings. I had fun painting them. When I line them up and look at them, I can see improvement from day to day. I’m getting better at painting trees. I’m getting better at painting sky. I’m even getting better at painting plastic pink flamingos. This entry was posted in Uncategorized and tagged goals, painting, Tiny Paintings on January 27, 2016 by releaf1954. I know the handful of people who read this blog regularly are wondering about the paintings. I suppose there may be some people checking out my blog for the first time and they wouldn’t know about the paintings. You might be thinking, “What paintings?” Just in case, I will explain. I started this blog on my birthday almost three years ago. 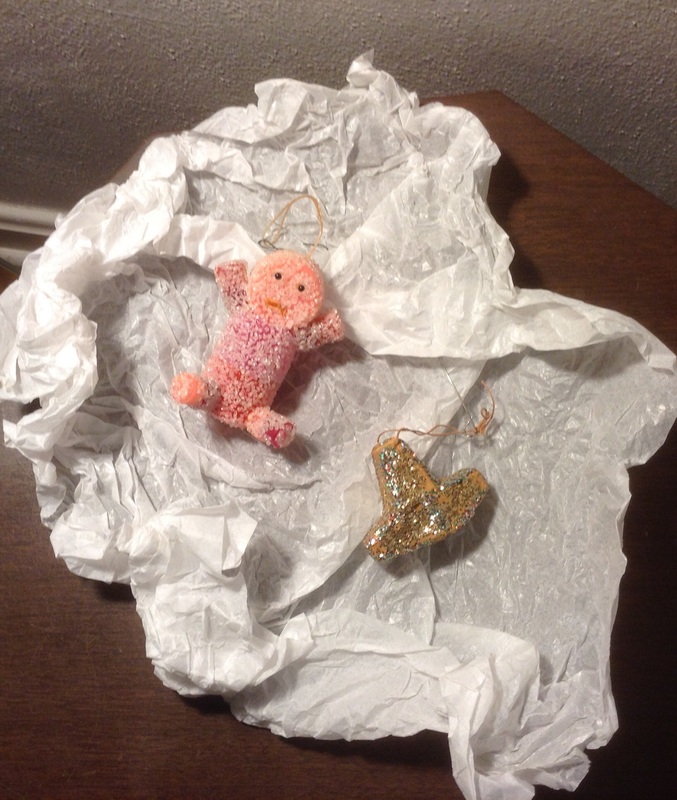 I was turning fifty-nine and I wanted a way to motivate myself to do something creative before my sixtieth birthday. I set myself a goal of doing fifty creative things, including at least one art doll, one art quilt and one 16” x 20” painting. I managed to meet that goal (barely) and then I set a new goal for my second blog year. I had surprised myself by enjoying the painting more than any of the other creative projects, so I decided to do fifty paintings in my second blog year. I procrastinated, as usual, so I ended up doing the last twenty paintings the last twenty days before my birthday, but I got them done. Woo hoo! Then I had to set a new blog goal. I resisted doing it for a while, but then I settled on fifty more paintings, with a new requirement. I had always wanted to learn to paint en plein air, so I decided the new paintings would all be done outside. I knew I was setting myself up for a very uncomfortable January if I procrastinated again. I hoped that thought would be enough motivation to keep me from putting off half of my paintings until just before my blogiversary. Well, I didn’t put off half of my paintings until just before my blogiversary. Over the course of this last blog year, I managed to finish exactly ten plein air paintings. Instead of twenty paintings to finish in the last twenty days before my birthday, I found myself needing forty of them. Then I procrastinated one more day, which brings us to today. Today, I finally painted. 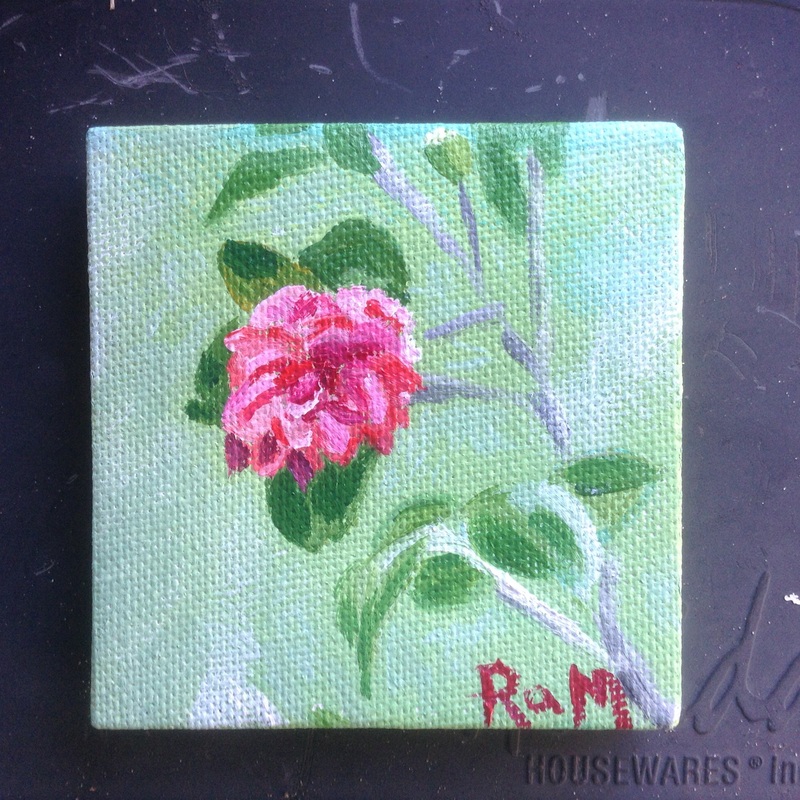 I took a tiny canvas into my side yard and I painted my neighbor’s camellia blossom. My daughter was visiting and she encouraged me to paint another painting. 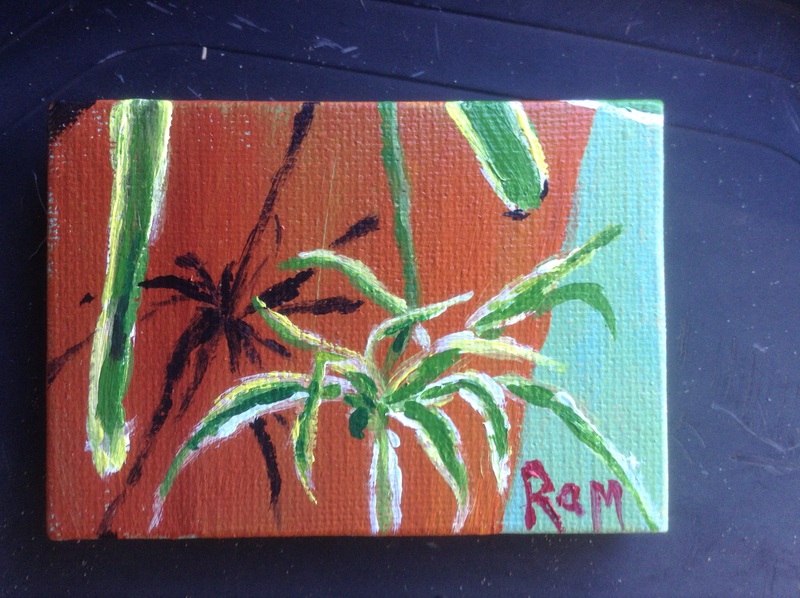 She found a potted spider plant and suggested I paint that. Then she saw the look on my face and suggested I try painting just the baby plant that was hanging over the side of the pot. I decided to give it a try. Two down, thirty-eight to go. This entry was posted in Uncategorized and tagged painting, Plein air painting, procrastination on January 20, 2016 by releaf1954. It’s Wednesday. Tonight there will be a drawing for the biggest lottery jackpot in the history of the world, an estimated 1.4 billion dollars. As I’m typing this, people are standing in lines all over the country, hoping to buy the one lucky ticket that will change their lives forever. I guess most of us wonder what we would do if we were suddenly wealthy. We dream of new cars and new houses and trips around the world. We dream of being able to afford to fix things when they break. My husband bought a couple of tickets for this giant jackpot, just because it’s fun to dream. I try to get into the spirit of his dream, but I fear I jinx his chances. The truth is, I would not want to win the biggest jackpot in the history of the world. I would like to be able to fix things when they break, but I have no desire to be rich enough to buy a senator. Well, maybe just a congress person from a small district, after taxes. The point is, big money is a big responsibility and I don’t want that burden on my shoulders. I’ve watched “The Lottery Changed My Life” and I’ve seen way too many stories of conflict and heartache following a big win. None of those wins was as big as the jackpot that could be won tonight. This one could be won by a giant office pool and everybody in the pool would be able to call in rich tomorrow morning. My husband is retired and I make tie-dye for a living (okay, not a living; a pittance, but still…). We don’t need to call in rich tomorrow morning. I imagine how I would feel if I won that big jackpot and “thrilled” is not the word that comes to mind. I think “anxious” is a bit closer to the mark. Perhaps “terrified” would be even more accurate. If I had that kind of money, I would want to use it to do good but doing good can be tricky. Sometimes the best-intentioned actions have unexpected consequences. I like having a simple, anonymous life. I wonder what it would be like to be rich, but I don’t really want to know. I’m comfortable with getting by on very little. I’m good at it. Being rich would take me way out of my comfort zone, so I hope the lottery fairy overlooks my husband’s quick-pick numbers and gives the win to a large group of folks working for some heartless corporation. My husband doesn’t read my blog, so he won’t know I’m jinxing his chances. Please don’t tell him. Let him dream. This entry was posted in Uncategorized and tagged dreams, lottery, powerball, wealth on January 13, 2016 by releaf1954.